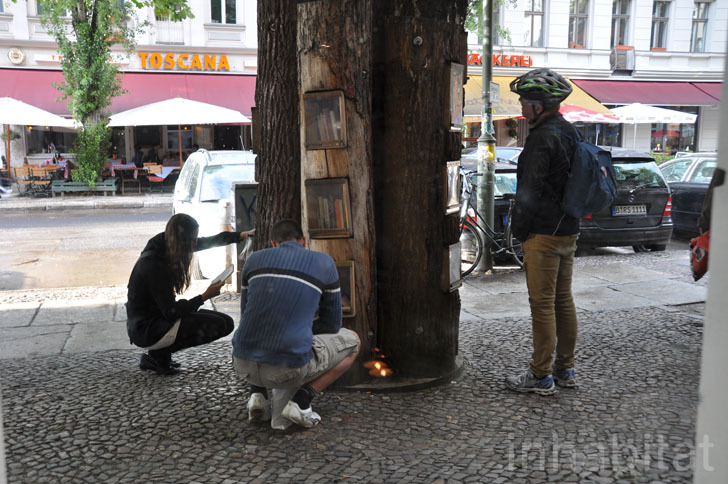 Book Forest: Berlin Turns Fallen Tree Trunks Into a Free Book Exchange! 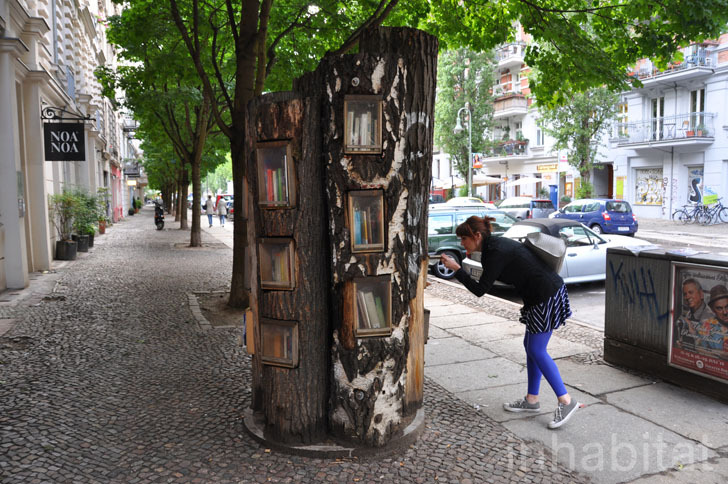 A forest of <a href="https://inhabitat.com/6-delightful-pop-up-libraries-to-encourage-reading-this-summer/" target="_blank">book-bearing</a> trees has sprouted up on the streets of Prenzlauer Berg in Berlin! The program, called Forest Books by <a href="http://www.baufachfrau-berlin.de/en/stadtraeume/stadtmoebel/buecherwald/" target="_blank">BauFachFrau</a>, is part of the <a href="http://www.bookcrossing.com/" target="_blank">BookCrossing </a><a href="https://inhabitat.com/little-free-library-tiny-house-shaped-boxes-let-you-take-a-book-or-leave-one/" target="_blank">book swap club</a>, which brings free books to public spaces around the globe. Neighborhood residents are welcome to leave a book they loved, or take one from the plastic protected hutches cut into the tree trunks. 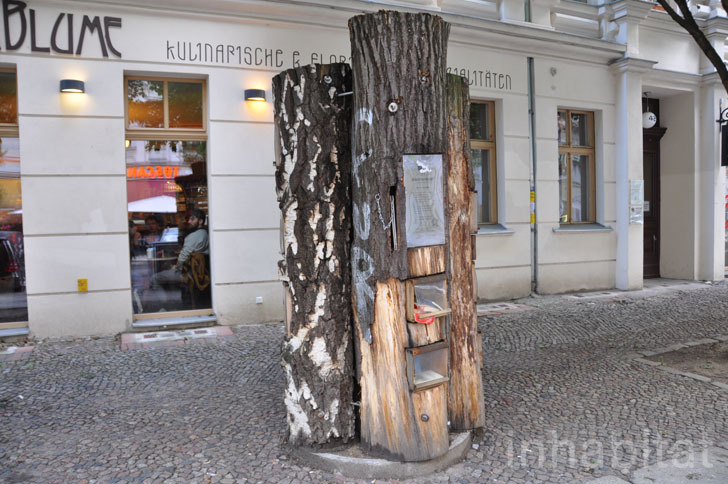 The <a href="https://inhabitat.com/new-uk-library-fits-within-a-phone-booth/" target="_blank">book exchange kiosk</a> is set amidst a tree lined block in Prenzlauer Berg, in front of a quaint dessert café. All throughout the day, neighborhood residents young and old busily use the Bucherwald, bringing their <a href="https://inhabitat.com/reused-container-becomes-dutch-childrens-library-pop-up-parable/" target="_blank">old books and exchanging them for “new” ones</a>. The kiosk itself is <a href="https://inhabitat.com/gleisdreieck-parks-minimal-playground-is-built-simply-from-wood-ropes-and-steel/" target="_blank">made from fallen trees</a> cut at varying heights and bolted together to mimic a tree cluster in the forest - they even still bear the texture of rough bark. Three or four rectangular box shelves are carved into each trunk. The wooden boxes are protected from the elements by heavy plastic flaps that are hung over the openings. Visitors can open the plastic flaps to <a href="https://inhabitat.com/weapon-of-mass-instruction-is-a-mobile-library-that-disseminates-free-books-in-argentina/" target="_blank">browse the books</a> left inside, or add their own. 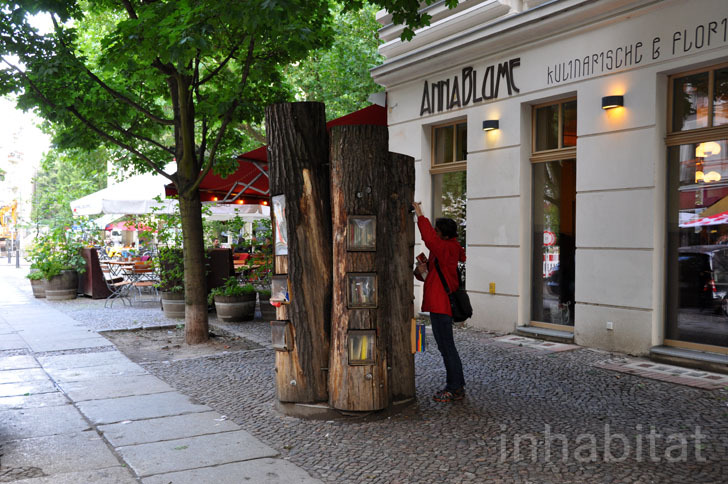 The urban bookcase can hold up to 100 volumes at a time, and on the day that Inhabitat visited books ranged from popular novels to history books, DIYs, and children’s books - in both German and English. The Book Forest was installed in 2006 with the intention of remaining just until June of 2008, but it has become so beloved that it is still widely used today. 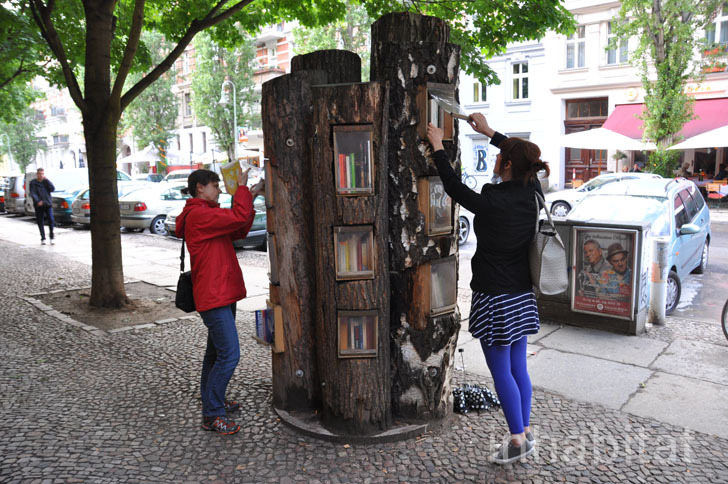 The Berlin Book Forest encourages literacy, while also promoting education on the supply chain of <a href="https://inhabitat.com/nyc/obsolete-nyc-phone-booths-turned-into-free-mini-libraries-by-architect-john-locke/" target="_blank">books</a>- from forest to wood to paper. 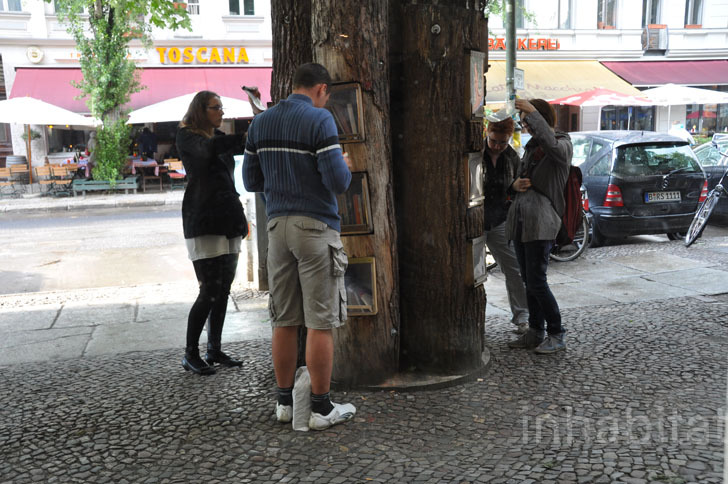 A forest of book-bearing trees has sprouted up on the streets of Prenzlauer Berg in Berlin! 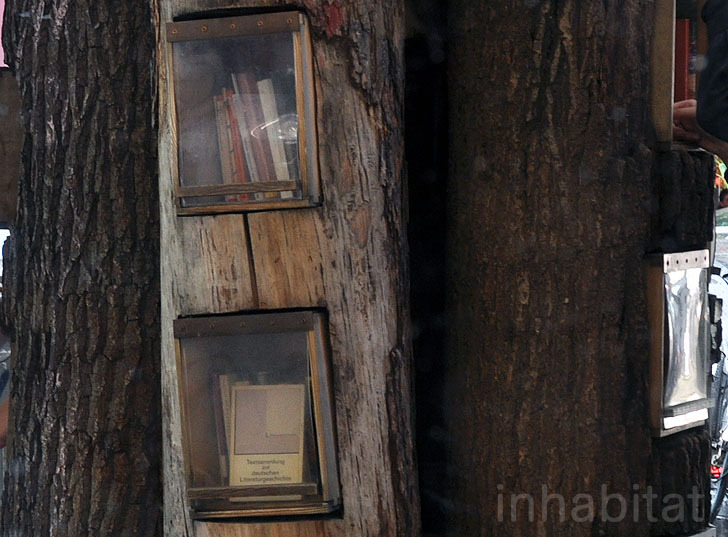 The program, called Forest Books by BauFachFrau, is part of the BookCrossing book swap club, which brings free books to public spaces around the globe. 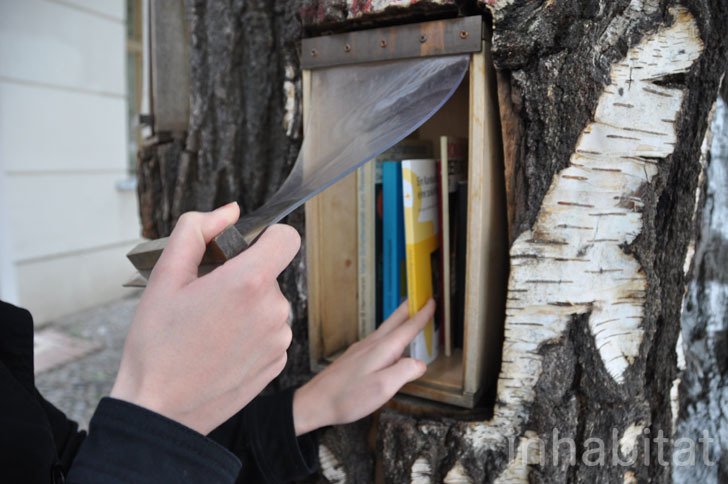 Neighborhood residents are welcome to leave a book they loved, or take one from the plastic protected hutches cut into the tree trunks.